Andy Hayworth is a kid who rocks! His musical interests encompass all genres from classic rock to rap, and sometimes passes time by playing the drums. In the classroom Andy maintains a 4.5 GPA and scored in the top 3% nationally on the PSAT’s. He is a 3x state qualifier as a member of the Hoover speech and debate team. 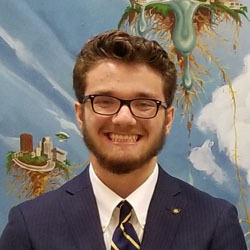 Andy has been accepted into the Kent State University computer science honors college for the fall of 2019 and plans on a career in video game design. He also works as a server in a retirement community. Rock on, Andy! Anthony Parker of Canton McKinley High School is extremely active in his school and community and participates in AP and college level courses. After high school, he plans to pursue a career in Political Science. He has worked on local and federal campaigns and participated in community service projects. To date, his accomplishments include: member of McKinley Speech and Debate Team where he served as a Congressional Debate; Director of Tournament Organization and Debate Captain; served as Vice President Key Club; Treasurer of Model United Nations chapter; At-large representative for Canton City Youth Council; Vice President of McKinley's Student Council and a member of National Honor Society. Anthony's awards include: three time State Qualifier, Ohio Speech and Debate Association; two time Member of Attorney General Mike DeWine’s Teen Ambassador Board; 2018 Buckeye Boys’ State Delegate and four time Academic Letter Recipient. 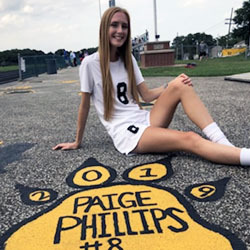 Paige Phillips of Cuyahoga Falls High School is our newest Kid Who Rocks! 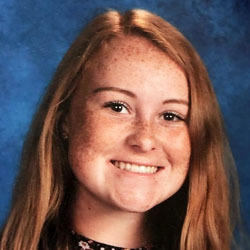 She is a National Honors Society Member, a 2-year Rotary Scholar Award recipient, A 4-year Scholar Athlete Award winner, and a 4-year Letter Woman for Black Tiger Marching Band. 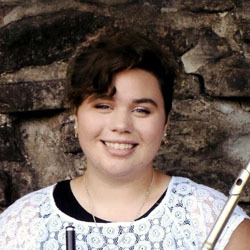 She is the Clarinet Squad Leader and member of the Cuyahoga Falls High School Symphonic Band. Paige currently holds a 4.5 GPA and has placed on the High Honor Roll every semester since 6th grade. She's lettered in Varsity Soccer all 4 years, received an Honorable Mention in the Suburban League last year, and plays for NEO Soccer Club. 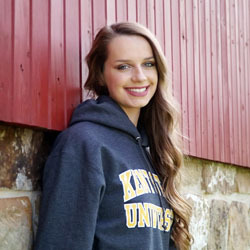 She plans to attend Baldwin Wallace College and major in Sports and Business Management. Meet Rachel Randolph of Tuslaw High School. She is a Kid Who Rocks. She's an accomplished singer/songwriter who has performed in musical theater. She's a multi-instrumentalist who seemingly can play whatever she picks up. When Rachel is not sharing her talents in school, she's working at outside gigs for pay. Her future plan will take her to the University of Akron to pursue further musical education and would like to be a band director some day. 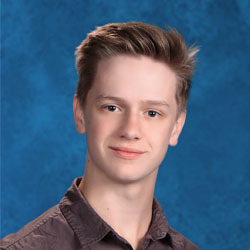 Brady Rowan of Hoban High School is a member of the National Honor Society, Student Council Fundraising Committee, Student Ambassador, Hoban Dance Team Captain, Peer Mentor, and a recipient of the Monsignor Dowed Award, which is the highest honor given at Hoban. He's been on the Highest Honor Roll every grading period. A photo that he took was selected for the 5th annual Hoban Purchase Prize. 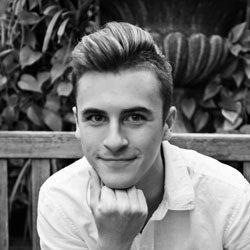 He is a Senior Advanced Competitive dancer for the I'd Rather Be Dancing Studio. He was a Nexstar National Talent Champion and took 1st place in the highest scoring solo. His teachers take note his quiet but persistent enthusiasm for everything he takes on and he exhibits genuine joy when other classmates succeed. Brady plans on becoming a Nurse Practitioner and would like to minor in Photography while continuing to dance. One WONE Listener (18 years or older) from a household may win a prize from Akron's Home of Rock & Roll once every 30 days. Persons from households where someone has won a prize valued at $500 or more shall be ineligible to win any other prize for a period of one year. In most cases, you will be asked to come to the station or be present to win to claim your prize. No purchase is necessary to enter or win any WONE Contest. We will need a photo ID such as your driver's license. No winners by proxy will be allowed; prizes are non-transferable. Anyone may win one of our games except employees (or their immediate family members) of The Rubber City Radio Group, Inc., any Advertising Agency connected with Rubber City Radio Group, any station advertiser (or Agency representing said advertiser), or any commercial radio station in the regional market. WONE will file a IRS Form 1099 on any prize given in excess of $500 value. Winners of small prizes will be required to sign a receipt acknowledging that they have won the prize and that it was received. Winners of large prizes will be required to sign a release giving us permission to use their name, likeness and recorded voice to promote the awarding of the prize, and to acknowledge the probable tax liability, and avowing that they have complied with all of the contest rules, winning the game fairly. In every game, the judges will be appointed by WONE. The decisions made by our judges shall be final. In the event, the rules of any contest or game must be changed while the game is in progress, an announcement shall be made on WONE, on the day the change is to take effect, at approximately 7:12am. That change shall be posted to the the contest rules page on our website (http://wone.net), and will be available at the reception desk at WONE, 1795 West Market Street, Akron, OH 44313.